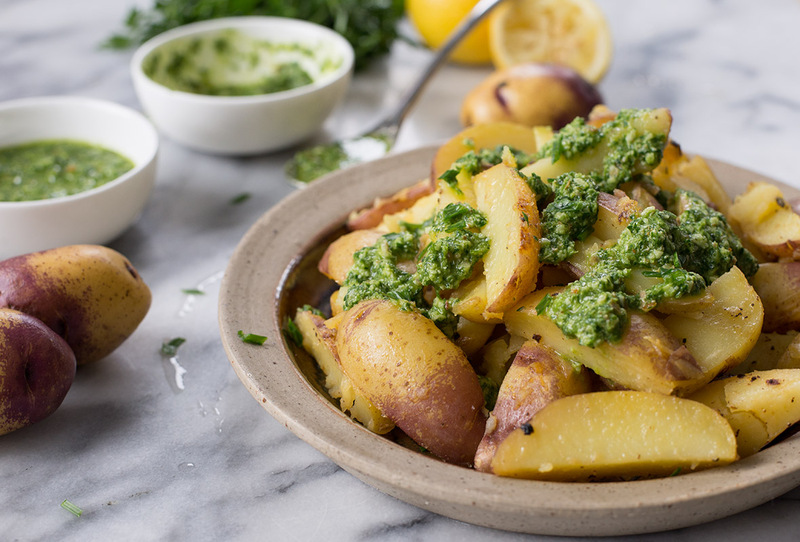 Pan-fried lemon potatoes with a creamy, nutty chive pesto. The perfect side dish for the holidays. Vegan and gluten-free, too. Combine potatoes, lemon juice, salt, butter in a dutch oven or large pot. Add just enough cold water to cover, then bring to a boil over medium heat and cook until potatoes are tender about 20 to 25 minutes. Continue to cook until pan is almost dry, then add in the butter. Gently fry potatoes until crispy and browned. Place on a platter. While the potatoes are cooking, make the pesto. Add the chives, parsley, almonds and garlic in a food processor and chop until fine. With the machine running, gradually add lemon juice and remaining oil through feed until incorporated. Season to taste with salt and pepper. Drizzle potatoes with chive pesto.